Accountable Kids is a unique parenting program designed to teach accountability and responsibility in the home. It is a back-to-basics system which includes essential parenting principles and concrete stepping stones that strengthen relationships and build a foundation for success; an ideal program for ADHD natural treatment therapy. Children learn to balance choices and consequences in a fun, productive manner. They experience the joy of being a vital, contributing member of the family and develop confidence and self-worth. The Accountable Kids program provides everything parents need to maximize efforts and bring structure and harmony into the home. All Kits now come with Instructional DVD! The Accountable Kids Kit includes an instructional DVD, 1 progress board, 50 Reminder Cards, 3 blank Reminder Cards, 10 Tickets, 10 Bonus Bucks, 3 Special Date Cards, 2 sticker sheets,4 Best Behavior Cards, and 2 Privilege Passes. The kit is a perfect gift for children ages 3-14. We recommend one kit per child. The progress board is the central part of the program, providing a place to mark achievements and view goals. It is made of select white pine and laser engraved with fun graphics that help children know how to use the program without continual direction. The board can be stained, painted, or decorated. Dimensions are 11�X6�. 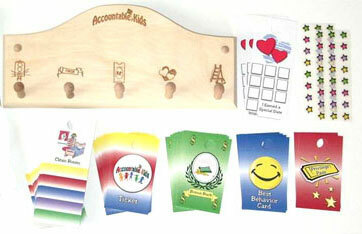 The kit includes fifty different Reminder Cards displaying custom art work representing different tasks. All cards are heavy weight, professional card stock and coated for extra durability. 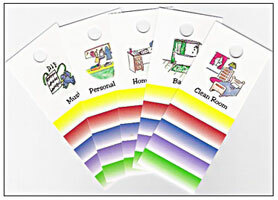 We have included 3 blank cards so you can customize the program for your child. Reminder Card dimensions are 2�X5�. 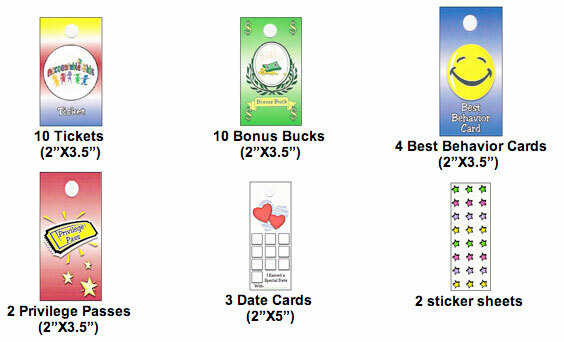 The kit also includes Tickets, Bonus Bucks, Privilege Passes, and Best Behavior Cards. The Instructional DVD provides step-by-step guidelines to using all the components of the program. All cards are heavy weight, professional card stock and coated for extra durability. Card dimensions are 2�X3�.